Elastic Cloud Enterprise scales to whatever capacity you need. If you need more processing capacity because your allocators are close to being maxed out or because you want to enable high availability and need an additional availability zone, simply add more capacity and change your deployment configuration to make use of it. From the Platform menu, select Allocators to view the available capacity. 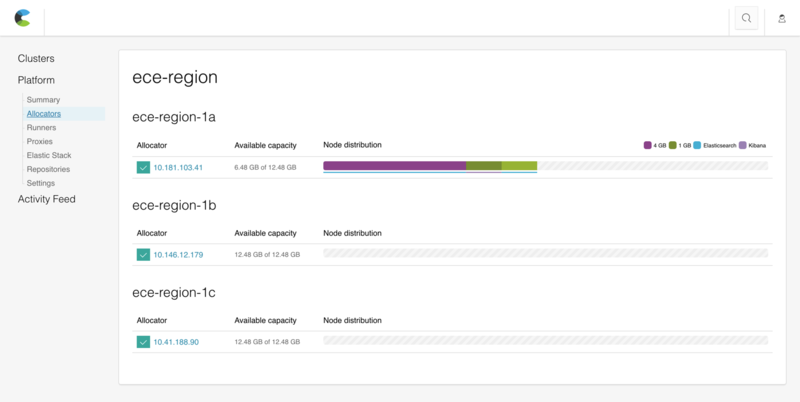 Install Elastic Cloud Enterprise on additional hosts to create additional capacity. Assign roles to the additional hosts. If you need to handle a larger search or logging workload, assign the new hosts the allocator role. Resize your deployment to handle a larger workload.